The Center for Cognitive Science, founded in 1994 as one of the first centers of Cognitive Science in the United States, represents a community of researchers and scholars who cross disciplinary boundaries to explore relationships between cognitive psychology, linguistics, philosophy, neuroscience, and computer science. A thriving field with unlimited paths of inquiry, cognitive science offers students the opportunity to approach the study of the mind and brain from an array of intriguing perspectives. Through the Social Sciences Interdisciplinary major, and graduate programs in Computer Science, Linguistics, Philosophy, Psychology, and Communicative Disorders and Sciences, UB's talented students drive innovative research and world-class scholarship in the field of cognitive science. 3/7/19 Have Questions? Contact Us! The Center for Cognitive Science hosts the Cognitive Science Colloquia series and the Distinguished Speakers in Cognitive Science series, featuring internationally-recognized experts in cognitive science. These events are free and open to the public. The Center attempts to keep our students, faculty, and partners informed of the news and activities in local and international cognitive science communities. Join today! Cognitive science is the study of how the mind works, both in its conceptual organization and in its computational and neural infrastructure. 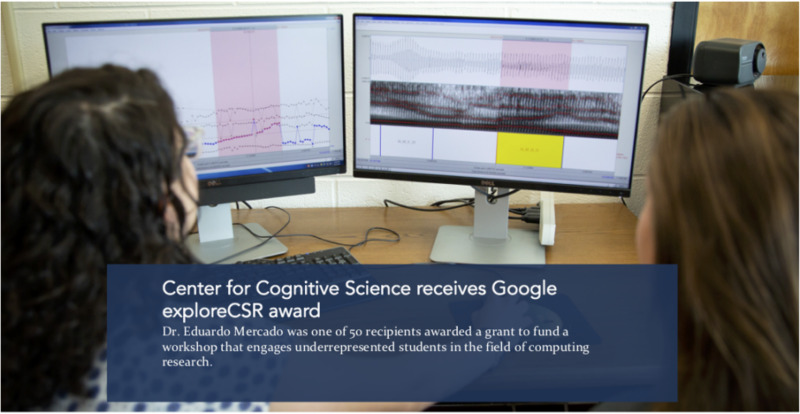 Your gift supports the students and faculty in the Center for Cognitive Science who conduct this vital research.